I have written a number of posts on various aspects of openness since this blog was launched back in 2007, with posts in recent months covering topics such as protocols to support open services (“OpenSocial and the OpenSocial Foundation: Moves to W3C“); the implications of open licences (“Flickr and Creative Commons; Lessons from Open Source Software“) and moves towards open practices in the UK (“Report on Modernisation of Higher Education: Focus on Open Access and Learning Analytics“). I am currently working on the EU-funded LACE project. The LACE (Learning Analytics Community Exchange) project team members have a similar commitment to open practices to support of the project. 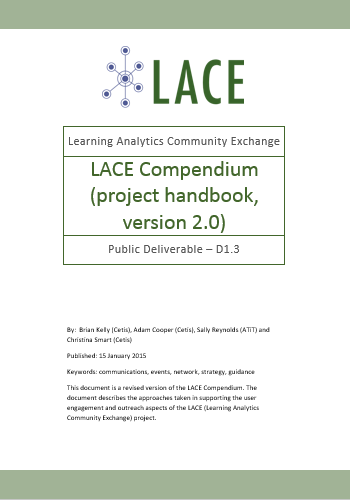 As an example we agreed that the LACE Compendium, the project handbook which documents the policies and practices the team are taking in supporting the user engagement and dissemination aspects of the project, would be published under a Creative Commons licence. The first version of the Compendium, which was published in April 2013, described our initial plans for the outreach work. This has been significantly updated in the light of experiences and feedback from team members. The latest version containing 45 pages which cover our strategies for user engagement, events and development of our network of policy makers and practitioners with interests in learning analytics. The document also describes approaches we are taking to measure the effectiveness of the strategies and concludes by summarising approaches for ensuring the sustainability of the project assets, including project deliverables, other project resources, the channels used in supporting the work and the communities themselves. Encouraging feedback on the document, since others who may wish to reuse the content should benefit from feedback. Enabling others to use the document, thus saving effort from having to develop similar project documentation. Allow others to build on the documentation should there be changes to the project team. Support the long term preservation of the project’s resources by minimising legal and licences barriers to reuse of content. To enhance the reputation of the project team. There are resource implications associated with the implementation of open practices and, in keeping with a culture of openness, it is appropriate to acknowledge such implications as well as highlighting the potential benefits of providing Creative Commons licences for project deliverables. Unlike the value criteria for copyrighted resources (making money) the value in the project team’s resources lies primarily in their reuse, the feedback we receive and embedding of the resources and the ideas across the community. Feel free, therefore, to reuse this report and our other deliverables. Your feedback is, of course, encouraged. In traditional lecture hall settings, it is difficult for a teacher to follow the progress of each and every student. It is impossible to adapt the pace of the course to match individual needs. Online provision allows the capturing of a range of data that can be used to monitor student progress. Advances in big data and learning analytics can help our higher education system customise teaching tools and develop more personalised learning pathways based on student data. However, the collection, analysis and use of learning data must only occur with the explicit consent of the student. Data can capture how students engage in the course, interact with other students and retain concepts over time. It can provide information on the learning process as opposed to just learning outcomes. Teachers can experiment with different approaches and examine the immediate impact. Data can also be used to identify at-risk students at an early stage, assisting in efforts to increase retention rates. While still a relatively young field, exciting developments in learning analytics are underway. Several universities in the United States have programmed automatic dashboards, giving teachers the possibility to monitor their student’s performance live. The massive availability and usability of data has also great potential for empirical research on learning and teaching. Stanford’s Lytics Lab is one example that applies empirical research to better understand the performance of students. Learning process and feedback tools are yet another development that allows students to monitor their own performance and adapt it accordingly. The Open-Learning Initiative of the Carnegie Melon University and the Check-My-Activity-Tool of the University of Maryland are two examples of these promising developments. Note that the 37 page long report is available in PDF format. As part of its work on the LACE (Learning Analytics Community Exchange) project, Cetis is organising a one day summit event to broker collaboration around the idea of an Open Learning Analytics platform – based on principles of modularity, open architectures, and open standards – in Amsterdam on 1st December 2014, collaborating with colleagues from the University of Amsterdam and the Apereo Learning Analytics Initiative. We have seen how the Modernisation of Higher Education report which covers New modes of learning and teaching in higher education has given a high profile to the importance of learning analytics. In addition Learning Analytics and interoperability are identified as key areas for research and innovation in the Horizon 2020 call ICT-20, “Technologies for better human learning and teaching“. The time is therefore right to gather a European critical mass of activity behind the idea of an Open Learning Analytics platform. The purpose of the Open Learning Analytics Network Summit Europe event is to develop a shared European perspective on the concept of an Open Learning Analytics framework, based on a critical view of where we are now and what is feasible in the next 3-5 years. The intended outcomes of the summit are concrete plans for collaborative research and innovation. These plans will set out to meet the challenges and realise the possibilities of 21st century learning and teaching, including those outlined in the ICT-20 call, in a way that properly embeds the Open Learning Analytics principles. The Open Learning Analytics Network – Summit Europe 2014 will take place at the Allard Pierson Museum, Amsterdam on 1st December 2014. Participation is invited from public and private sectors, including innovators from all sectors of education and training, open source and proprietary software developers, people with experience of learning analytics interoperability and architects of modular and distributed systems. Further information including the full call for participation is available on the LACE project web site. The EU-funded LACE (Learning Analytics Community Exchange) project is “bringing together key European players in the field of learning analytics (LA) and educational data mining (EDM) in order to support the development of communities of practice and share emerging best practice“. In order to encourage discussions on this topic the LACE project team have created an infographic which depicts “the roads to more differentiated and personalised education“. A portion of the infographic is included in this post.The full infographic (which can be downloaded as a hi-resolution PDF) goes on from the traditional and personalised educational environments to summarise how learning analytics can help; the learning analytics cycle; the four levels of learning analytics; the teacher’s role and ask ‘what’s next?’. But if you have an interest in learning analytics how should you ensure that you do not miss any of the blog posts? Traditionally this has been done by adding a blog’s RSS feed in your RSS reader. In the case of the LACE project blog the RSS file is available at http://www.laceproject.eu/feed . However RSS usage seems to have declined significantly in recently years, particularly since July 2013 when Google closed down the Google Reader. These days many professionals seem to keep informed on new articles and blog posts through their Twitter network. If you use Twitter you may find it useful to follow the @laceproject Twitter account or monitor the #lacproject hashtag which is used by the project team. However as well as RSS readers and Twitter, another way of ensuring that new LACE project web sites are delivered to you is to subscribe to an email delivery services for new posts. 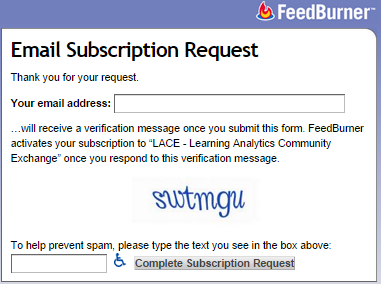 You should note that if you wish to unsubscribe from this service you can do so at any time. I suspect I am not alone in finding that my interests and activities in my professional life no longer focus primarily on digital content but now encompass data. There are two events taking place over then next four weeks which may be of interest to those with interests in the analysis of data to support learning and research. The EU-funded LACE (Learning Analytics Community Exchange) project is organised a one-day event which will be held at the Open University on 24 October 2014. This is a networking gathering for everyone interested in learning analytics. Under the auspices of the Society for Learning Analytics Research (SoLAR) and organized by Europe’s Learning Analytics Community Exchange (LACE), this event forms part of an international series. SoLAR Flares provide opportunities to learn what’s going in learning analytics research and practice, to share resources and experience, and to forge valuable new connections. SoLAR defines learning analytics as ‘the measurement, collection, analysis and reporting of data about learners and their contexts, for purposes of understanding and optimizing learning and the environments in which it occurs’. The LACE project is working to promote knowledge exchange and increase the evidence base in this field, so that analytics can be used effectively in a wide range of educational settings, including schools, higher education, workplace learning and within MOOCs. We therefore invite technology specialists, teachers, researchers, educators, ICT purchasing decision-makers, senior leaders, business intelligence analysts, policy makers, funders, students, and companies to join us in Milton Keynes. The event is free to attend, so I suggest that you sign up quickly in order to guarantee a place. On Thursday and Friday of this week 1:AM London, the first altmetrics conference is taking place at the Welcome Collection, London. Note that a Twubs archive for the event hashtag is available. As illustrated in the screenshot the conference progamme begins with a review of recent altmetrics activities followed by a session on how people are currently using altmetrics. Further sessions on the first day cover research communications, ethical implications of research involving social media, impact assessment in the funding sector: the role of altmetrics and uses of metrics within institutions. The sessions on the second day cover altmetrics and publishers, lessons learnt, tracking other research outputs, update on standards and a group workshop session to review activity around altmetrics to date, and to propose ideas for future development. 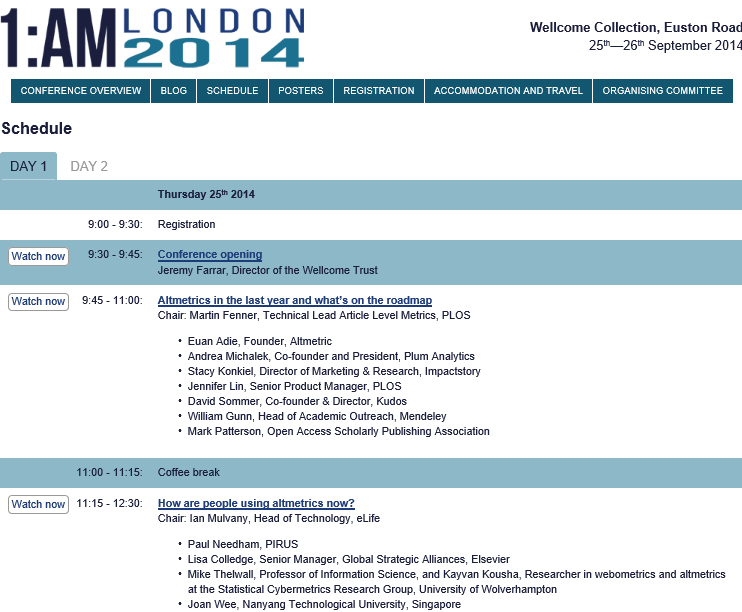 I will be representing Wikimedia UK at the conference and will present a poster on Wikimedia and Metrics. In a recent post I summarised the benefits of Using Twitter to Meet New People on the Way to Conferences. If you are attending either of these events and would be interested in making contact with others you may find the Lanyrd entry for these events of interest. Simply go to the Learning Analytics SoLAR Flare Event in UK or the 1:AM London Lanyrd entries and either track the events of interest or register yourself as a participant or speaker. As I’ve found with the IWMW event series, the details for the 40 speakers, 59 attendees and 15 people who tracked the IWMW 2013 event can help to identify key members of a community of practice with shared interests. Use of Lanyrd may help, I feel, to support the community of open practitioners who have interests in learning analytics and altmetrics. This will provide answers to questions such as: How will you maintain your online professional learning network? When will you adjust it? At what points will you actively add to it or delete from it? Is there a particular type of technology that you will employ to make the best use of your network? Will there ever be a point where you would create a new plan from scratch? My new job [as Innovation Advocate at Cetis] will provide an opportunity to prune my professional network, removing Twitter accounts, blog feeds, etc. which are no longer relevant to my new role (unless, for example, I still gain value for the personal connections). In November I began work in pruning my Twitter network, and on 13 November I reduced the number of people I follow in Twitter from 1,426 to 1,397. However it was just before Christmas, on 23 December, when I deleted a significant number of my Twitter community. As illustrated on that date the numbers of people I followed went down from 1,426 to 1,122, a drop of 324 (note the graph is taken from the Twittercounter service). I used the Social Bro Chrome extension for my Chrome browser in order to help identify followers to remove. As shown, this tool helped me to identify the people I follow who appear to have stopped using Twitter. The tool was also useful in highlighting Twitter accounts which may be used by spammers. Of course, the more difficult decision to make was when to stop following accounts which are being used in a legitimate way, but are no longer aligned with my main professional interests. The decision I made was to remove significant numbers of accounts from contacts I’ve made over the years with the museums sector (unless I had a string personal connection. As can be seen I did not quite achieve my target of 1,000 followers (and the number has started to grow slowly since the purge). However the exercise was useful and I may chose to repeat it yearly. The intention in pruning my Twitter network was to enable the network to be reshaped in order to be able to more effectively engage with communities relevant to my new role as Innovation Advocate at Cetis. As I described in the blog post in which I summarised my plans for the development of my online professional learning network I intended to follow the accounts of my Cetis colleagues. In order to make it easier to view tweets from my colleagues I set up a Twitter list. Organise a range of activities designed to actively and passively integrate communities that are conducting LA/EDM research, early practitioner adopters, and those who are building first-generation commercial or open-source software. This integration would be used to stimulate creativity and accelerate the identification of viable and effective solutions to real problems, and hence to drive both current research and technology transfer. Create and curate a knowledge base of evidence. This will capture evidence for the effectiveness and the relative desirability of the outcomes resulting from use of various tools and techniques. The LACE project brings together existing key European players in the field of learning analytics & EDM who are committed to build communities of practice and share emerging best practice in order to make progress towards four objectives. 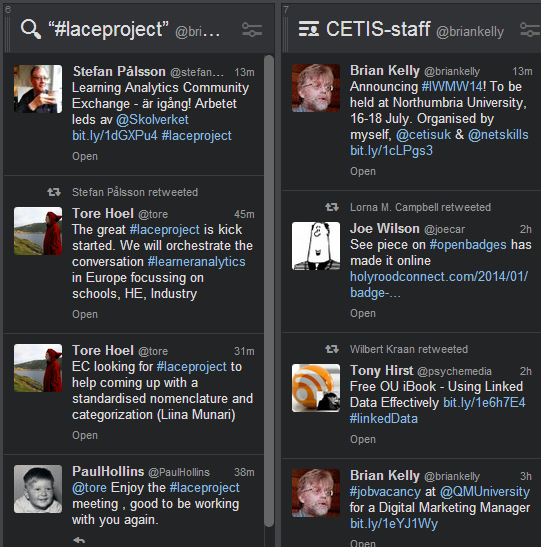 I have started to follow project partners using the #laceproject Twitter hashtag. Interestingly I have just noticed that the @TheLaceProject Twitter account is used to promote fashion and jewelry and so there will be an interesting clash of hashtags! How Do You Manage Your Twitter Network? My change of jobs provided me with an opportunity to reflect on my professional networks. This was helped by the Hyperlinked Library MOOC assignment which argued that one need to plan the growth of one’s network and to proactively manage it in order that the contacts reflect one’s changing areas of interests. I used to have an annual calendar alert which reminded me it was time to check the links provided on legacy project Web sites in order to ensure that technical or others changes hadn’t resulted in problems with the structural integrity of the Web sites (see the audit trail on the UK Web Archive copy of the Cultivate Interactive Web site). However it seems to me that it would now be more relevant to have an annual survey of one’s professional networks and to see what maintenance may be needed in order to ensure that the professional network continues to provide a useful role. Does anyone else do this?